Fellowship can be defined as that friendly feeling that happens among people who are joined for a common purpose. While many people may think of this in terms of their church, synagogue or temple, it should be considered a crucial element of workplace happiness and engaged employees. Healthy workplaces happen when people are able to enjoy working together in an environment that builds camaraderie and supports the addressing of problems, finding new solutions, trying out new strategies and celebrating successes. Fellowship, therefore, fits right in as a cornerstone of workplace health and happiness. You’ll find many suggestions for creating a healthy workplace but at PMC, we’ve enjoyed watching how our team building game, The Search for The Lost Dutchman’s Gold Mine, strengthens fellowship as people spend time together, share a fun and unique experience, work towards a common goal and enjoy being away from a typical day at the office. And, that includes the healthy aspect of getting away from the technology and screens encountered each day! The Lost Dutchman’s Gold Mine exercise is an experiential interactive board game that delivers an additional valuable team-based insights and discussions through its hands-on play. Players learn about collaboration, communications, strategic planning, leadership and other enriching information in an unforgettable way and the game structure allows for powerful business-improvement oriented debriefing discussions. It works exceptionally well with very large groups. People play in team tabletops of 5 or 6 and there is energy, laughter, discussion, decision-making, movements, understanding and learning taking place during the game play and from its powerful debriefing session. You’ll find that Dutchman is surprisingly reasonable regarding cost and planning time. You can either Rent or Purchase the exercise depending upon what works best for your situation. Another plus is that you can facilitate the game in-house, yourself, for any size group, without the need to hire a master presenter. People love a non-threatening change of pace and research shows that fellowship and playing games improves physical and mental health, lowers stress and blood pressure, produces endorphins and boosts our immune system. Set up a fun and beneficial learning environment and increase fellowship and motivation with The Search for The Lost Dutchman’s Gold Mine. It’s been used, worldwide, for over two decades and remains just as appreciated and relevant today as it was originally. 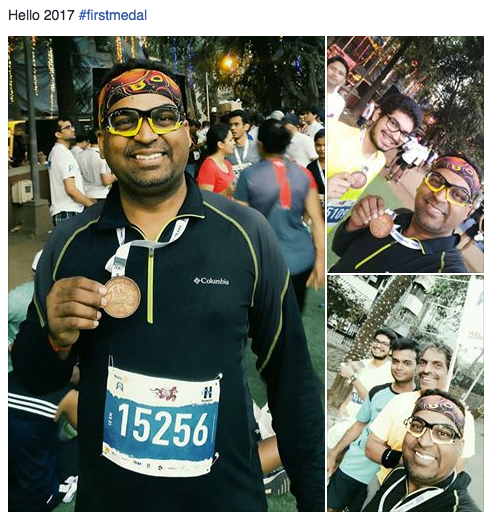 My friend Jimmy Jain posted up a picture of himself after running a race. The images of him below should tell you all you need to know about motivation, if you spend a moment to consider individual performance and how things really work. You cannot get this satisfaction from some extrinsic reward system; it is all about Intrinsic Motivation! In high school, I ran one year of cross-country on a team that included Leon Nocito and Lee Mallory. That was in 1965 and I did it to get in condition for playing tennis (Jay Einstein and I were a really good doubles team who could beat our number 1 and 2 singles players even though we sucked at singles, ourselves. We took great pride in our play and were 7-0 through the first matches of our senior year (1966) ). In the picture above, you can see Jimmy is obviously taking great pride in his running success and he is most likely comparing his personal performance to his individual goals. I am also guessing that both Leon and Lee would run far faster! But that is NOT what motivation is really about. It is about self and team and you can see the peer support Jimmy has if you look at the others in the side pics! Leon top left and Lee top right and the rest of the team. Leon, undefeated for two seasons, almost always ran a course record each race. Lee, always finished second to Leon, ever race, with Lee also generally beating the course record each race. Leon would never let Lee beat him and Lee always pushed Leon to new records and they finished 1-2 in the State Championship. One time, Leon was really sick and he STILL would not let Lee beat him — he nearly died, but that was simply how things were. 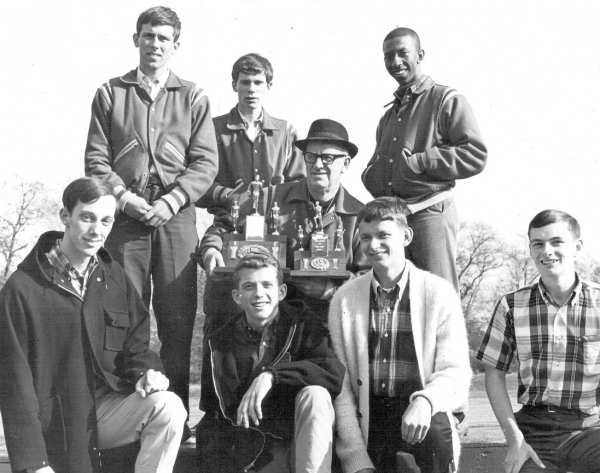 Our Track & Field team was unbeaten in ’63, lost one dual meet in ’64 & was unbeaten in ’65 and ’66. Coach Cosh had records like 125 wins in a row in track as well as the cross-country successes. We beat everybody. Unbelievable! And these kinds of motivations and accomplishments are really found in everyday kinds of things, from the Special Olympics kids running their races to the bicycle club events with groups of people all doing the best they can to the professional athletes who do it for money (but also for pride). When that pride of accomplishment disappears, so does the motivation to perform. So how are you running YOUR organization? How important are those intrinsic rewards based on personal goals, measured improvements, and peer support for teamwork and accomplishments? Are your people supporting each other or competing to beat the others? Is it a team-based effort to improve group performance or one of competition, sabotage and under-cutting to allow one person to “win” and create failures if they don’t. Coach Cosh knew how to get whole groups of kids working together to generate championship levels of performance. He knew how to get Leon and Lee and Don and John all running as hard as they could individually to generate that TEAM success. Can you do the same to generate peer support, or do you try to motivate people with extrinsic rewards that are ineffective for the bottom 50% of your organization? If you want some insights into how this all plays out, ask me about The Search for The Lost Dutchman’s Gold Mine exercise, where the goal is to mine as much gold as WE can but where tabletops will often compete rather than collaborate. It is one of the top leadership and organizational developmental team building games in the world, based on extensive user-feedback. Ask Jimmy — he is one of our long-time Lost Dutchman customers and he says he feels the same way after successfully delivering a client workshop! Or, click on the image below to go to a descriptive page on my website. How can we motivate people when we make them defensive? How can we expect innovation and process improvement if we are not actually encouraging people to share their thoughts and try new things? If we ask managers how they manage, they tend to give all the right answers. But is that really their tendency to act and perform in reality? Maybe. In the “Keeping Things Simple – Involving and Engaging” blog, I shared this cartoon that we call, “Trial and Error”. When we ask them to comment on the illustration, they tend to focus on what is wrong, rather than what else might be done, The ratio of negative to positive is about 8 : 1 and, if anything, the peer support appears more clearly in reactions to the different negative themes. In other words, eight comments focused on the negative and what they did wrong for every one good thing the managers might spot, such as they are stepping back and looking for more improvements and that the horse, will in reality push a wagon. Mothers usually call this “constructive criticism,” but I am not sure what good purpose it serves to continually point out what people are doing wrong, “even if it is for your own good.” as we so often hear as kids and teenagers (and workers, in so many instances!). and this will not serve to improve motivation or make things better. If anything, this blame frame will make innovation harder and decrease the likelihood of people trying to be involved and engaged. ALL of us need to focus more on the innovative steps to improvement and the reality that change is a requirement in the workplace. So is support and encouragement — every book on leadership will comment on that but that is not congruent with the behavior of many managers. Improvement is a continuous process, one that requires celebration of what is accomplished and continued reflection on possibilities and potential shifts in resource utilization. One might think that there is a train in their future? Note – clicking on the images will take you to some different, related posts. Take a moment and look at the above image and react to what you see before moving on, please. Just consider what might be happening with the people and their workplace. When I show this illustration to managers and ask for their reactions, we generally get a ratio of about 8 negative reactions to each positive one. In other words, eight reactions focused on the negative and what the people in the cartoon did wrong for every one positive thing about the situation. This is often called “constructive criticism,” but I am not sure what good it serves to continually point out what others are doing wrong. It does not build teamwork or increase engagement and it serves to smash down any intrinsic motivation that might have been occurring. Managers should be trained to look for business improvement opportunities and to look for things that can be improved. This serves solid business purposes. But when this gets expressed as Non-Support for Change and Risk-Taking, we cannot expect others to just go along with that. We embed the good with the blame and the people are more likely to run over the top of the hill and hide than come back to the wagon and continue to make improvements. Sure, their first attempt was pretty quirky and maybe they missed an idea or two about how they could get things done better. The Round Wheels are in the wagon. Carrot’s, too! Allow people to do things and celebrate their successes. If you look at the first cell after Apache Junction, it is connected on all three routes! This will allow a team to move from one route to the other without having the teams to come back to base – Is my understanding correct? In that case, shouldn’t the weather pattern be the same on day one for all the routes? I understand that this is a bit tricky, especially when teams can move out on Day 1, 2 or 3 based on them taking the videos and I would love to hear your thoughts on the same. YES, if they leave Apache junction, the start up point, they go into a block that surrounds AJ and that connects to all three routes. Leaving on Day One, with the rainy weather pattern on that day, they get punished for not planning and getting a Video. They use up an extra Fuel Card and they can see that will happen before they commit to actually leaving. There is no way around that weather — they are OUT and in a block that is “muddy” in how it is drawn with the light brown dirt and the squiggly lines. The rules say that this Mud does NOT occur on the High Country or Plateau Trails. But if you look at the map, the signs marking those trails start on the NEXT block and not this one. Having one large surrounding block enables a team to take ANY route on Day 2 — they can change their mind at no cost and simply go a different way. If they had planned to go on the Low Country Trail and Day One is MUDDY, one might expect a logical team to question that decision (they just got some new negative data!!) and take another route. This, of course, never happens!! They could also get information from teams that get The Videos and choose to go up to the Mine using the High Country or Plateau Trails on Day 2. The weather for Day One is the same for all three routes — Yes. Day One is Day One and they are in a block that is colored muddy, lined as muddy, and is clearly their first step out of AJ. If they stay at AJ, they consume 1 and 1. If they leave it is 1 and 2. The reality of being in charge is that the weather and the consumption of resources IS what you TELL THEM it is! Some might argue. Some might simply be confused so you explain the rules again. Some might try to cheat and save a fuel. But it is simple: If they leave on Day One, the cost is an extra Fuel Card! There are a number of similarly elegant little nuances to the map, like the movements around the Supply Depot near the Mine and the use of a Turbo for movement there as well as the actual number of days from AJ to the mine with the other resources available. Some of these features were simply the result of luck on my part and some were thought out — this one with the design of the block surrounding AJ was a planned one! We think that this game is pretty tight and easy to deliver. Over 20 years, we think that we have very congruent rules that make it easy to tie to themes of project management, strategic planning, team collaboration and inter-departmental collaboration, and to all sorts of issues around organizational alignment, leadership development and strategy implementation. It also seems to generate the same kinds of play and debriefing discussions. The above was from a user in India, but it could have been Germany or Dubai. Oh, did I mention that a major goal is to also have fun? You can find more about The Search for The Lost Dutchman’s Gold Mine by clicking on this link that takes you to our overview on Slideshare. Clicking on the link that is the image below will take you to an overview of the games on our website. You can also see the many articles in the blog about the game by clicking on my image below. A lot has been written about generating higher levels of performance to produce better results. And a lot has been written about improving engagement and involvement to improve innovation and employee retention. A further lot has been written about improving teamwork among employees and management. None of this is rocket science and none of this actually requires much of a budget or the involvement of the training department or human resources. None of this even really requires any support of senior management, although that should be an expected occurrence in organizations trying to implement improvements. What it does clearly involve is the active engagement of line managers. Here are actually Three Big Simple Ideas. Create some teams and allow them to accomplish things related to that alignment. Improve facilitation skills and use involvement to generate participation. Let me briefly expand and explain how you can take your people to a higher level of performance. And this will not cost anything. If you email me by clicking on this link, I will send you the free Square Wheels tool that you can try, with no obligation. But remind me of the offer from your reading this blog! 1 – Build involvement and engagement by facilitating a series of meetings on visions, missions, goals, expectations and feedback. The statistics are clear: Some or most people in many or most organizations do NOT really understand the overall goals and objectives of the organization – at best, this is 4 of 5 people but it is generally not that high. Data are clear on this, even though most managers would say that it is not likely in their organization. Your people might know their jobs, but they often do not understand how what they do fits into the bigger picture. Thus, we often see departmental squabbles when the customer is the one who is really impacted, which indicates an alignment issue. 90% of strategies fail to deliver even 50% of their objectives. Only 2% of managers are confident that they will achieve 80% or more of their strategy’s defined objectives. So much about the success of such initiatives are simply about facilitation and communications of visions, missions, goals, and expectations and changes in feedback and measurement systems. 2 – Create some teams and allow them to accomplish things related to the above. a wrong that you want to right. It has got to be something that you’re passionate about because otherwise you won’t have the perseverance to see it through. There are dozens of ways to build teams. Basically, they need to have some kind of challenge that they want to address and some kind of organizational support that they feel will allow them to address the issue. We use the simple process of facilitating Square Wheels One to both involve them creatively as well as get them to share and agree on some specific Square Wheels that are operating. This produces cognitive dissonance, a motivation to close the gap between the Square Wheel and some possible Round Wheels. One of the keys is their perceived likelihood of getting the support needed to address that implementation. Cultural and company cultural differences will lead to different strategies and tactics to address this opportunity. And I have written extensively around issues of implementation throughout the nearly 300 posts in this blog. Teams will form naturally in most workplaces if they are allowed. And there are all sorts of models that can be overlaid for the long-term, like Kaizen or Lean. Find one that works already in your organization — no sense reinventing that particular wheel! 3 – Improve facilitation skills and use involvement to generate participation. 45% of workers in The Americas agreed that they receive equitable compensation for their work. 44% say they would perform at a higher level if compensation were tied to performance / productivity. Reframing that, 55% of the workers feel that they do not receive equitable compensation (one can assume most feel undercompensated) and 56% of them are saying that they could accomplish more if they were better motivated. If you are interested in more statistics on these kinds of issues, Part IV of my post on managing and leading change summarizes a lot of data about people and performance. You can find Teaching the Caterpillar to Fly – Part 4 here. The issue is relatively simple. You have to stop TELLING them things and begin to ASK them more about their understandings and their ideas. You can save time by lecturing, but you lose all the energy that arises from involvement and ownership. Nobody ever washes a rental car! I’ve said it a zillion times: People do not take care of things when they feel no ownership involvement. If it is their idea, they own it. If they talk in defense of a position, they own it. If you can get them sharing ideas and deciding to do things differently, they own it. And all you need to do is provide the support and resources to help them get things done. John Junson, a cartoonist working with David Zinger at The Employee Engagement Network, just published his 365th cartoon around issues of employee engagement and the reality of the workplace. I thought this one was really cute and could certainly be used generically to stimulate discussions about some of the issues people face when dealing with managers. That interface to manager to worker is where the leverage really occurs in generating teamwork and innovation and personal growth. I am into metaphor, and the idea of a window on the world and a live plant are certainly. I think I might have her holding her arms up in a “touchdown” kind of gesture and someone said that the hind portion of the boss on the left side might have some skin showing, since he IS showing his (arse) by behaving as he is. But maybe I am just a little too direct, ya think? You can find some writings and other information about the impacts of increasing active involvement in the workplace at this recent blog, which connects to some of my other writings on this issue. DO have some fun out there. Do some things differently today than you normally do and see if you can make a small positive difference to someone. And realize that this engagement issue is only somewhat about other people and bad HR processes — it is a lot more about your people, their active involvement, related intrinsic motivation and the leadership behaviors that you choose to show that allows all of us to operate more effectively with our teams. Maybe I have been at this consulting and training stuff too long, but in a conversation with a prospect the other day, it really got me thinking about the reality of team building and organizational improvement and the VALUE of what we do. I have posted up before many of my thoughts on issues of impact and cost and time, from discussions about why I do not like icebreakers all that much in this article and in this one. I have also shared a lot of ideas about outdoor training kinds of events, a few of which I like but many of which I view as problematic, such as a paintball game with a group of people who may have some physical impairments. One, on fun and learning can be found here. Another discussion is found here. There have been a string of article focused on how to improve the impacts of training, such as this one focused on Motivation and Processes or this one talking about how training cannot improve work processes and thus performance. And there have been LOTS of articles on engagement and dis-un-engagement and the process of involving people for intrinsic motivation and performance improvement purposes. If you search “engagement” on the blog, you will find more than 20 articles playing all around the theme, with statistics and ideas and frameworks. What stimulated this post was a discussion with a prospect who has great experience facilitating teambuilding for organizations. His view was that a lot of companies do NOT want a fun learning event but would rather choose to simply do something fun. They do not want the session to relate to organization performance or work-improvement issues but simply want to throw some money out to a vendor to show their people that they care! The are looking for no ROI. It is kinda like what I see when I look at the “Team Building Offerings” of a place like Dave and Buster’s. They actually frame this dinner plus play on the machines as Team Building. Apparently, they think that they can meaningfully relate that arcade games like slotball and shooting hoops and coupons somehow relates to workplace improvement and claimed that teambuilding is one of the specialties of our staff and corporate event planners. I mean, really? Best “Learning Game” I have ever used… We purchased Dutchman for an offsite meeting to discuss Resource allocation and Collaboration. It was a breeze to facilitate. The participants loved it and more importantly, walked away with lessons that they were immediately able to apply back at the office. The slides and materials allow you to guide the group in almost any direction imaginable. I am still getting comments weeks after the session about the impact it made on the business and the improved performance. A small investment that generates huge results. But there is another reality that I wanted to mention, and that is the post-game debriefing activity that should connect the play to the real world of organizational improvement. Yeah, fun is good and all that, but how do we help people make the connections and help them to make better choices in the future. I have always talked about my exercises like Dutchman and Collaboration Journey as “excuses to debrief.” I want the game design and embedded metaphors to directly link to clean themes for improvement. Turbochargers become a metaphor for Best Practices, for example, and, “The goal is to mine as much gold as we can,” is really focused on the WE and optimizing overall success, rather than focusing on competing to win. Where there are winners, there are many more losers! The feedback from the participants was fabulous. I led the Dutchman’s Gold Mine game for our Store Manager development as part of their annual conference. During the game, there were a few “aha” moments but what really brought the point home was The Debriefing. There was a lot of great debriefing material to use and I focused on how the game paralleled our business and how much better the results could be if we collaborated better as an organization. Scott was extremely supportive and was always available to answer my questions or give me suggestions. I recommend this game to anyone that wants to build collaboration among and between teams. It is fun and effective! After renting the game to initially test it with two large groups, we bought the Professional Edition to run this company-wide. So, I like HARD questions that focus on the organization’s future. I like discussions that relate to choices people make in the game and then in the workplace. When I ask about what energizes, I relate it to what the managers could do differently. When I focus on Gold, I focus on choices to make improvements in results. The game was about maximizing ROI — that comes from optimizing communications, sharing resources, and working together. Games are fun and I like games. I like fun. I like to kayak and play pool and all that. But I think that a corporate learning event should be just that, a learning event. I like Dave and Buster’s food — I am just not sure of their impact on organizational improvement. Frankly, I think the teambuilding programs where you actually cook a dinner would be more impactful than simply playing, but the home page of D&B’s says that they have conducted thousands of these events. Is HR the Puppet Master or the Puppet? There was a great post this morning by Dan Rockwell on his blog, part of which I reproduce here simply because it is a great subject as well as a target of some of my cartoons. My worst experience with HR is a broken confidence. She smiled and listened and within an hour violated my trust. Human Resource personnel are among the most criticized people in business. Not understanding positions they’re filling. Managing paper better than people. Subservience to policy and procedure. Working for the C-Suit, not the people. HR matters because people matter. “They are underrated, over-criticized, and underutilized.” Doc says, change the name from Human Resources to Human Empowerment (HE). The job of HE is, “Maximizing human potential.” Doc goes on to say, “HE could be the single biggest champion of your companies Culture. Become more human. Since when does serious work prohibit smiling? Sit in the seats of workers and do their jobs. It is NOT HR’s fault, it is the C-suite that does to them what it wants and focuses them on the psychopathic side of running a business. Our Generally Accepted Accounting Practices treat people as a cost on the ledger of life. That crap all cascades down. Over my 30 years, I have seen some attempts to address it in one company or another. The average company will SAY something like, “Our people are our greatest asset,” but then go look for some of that. Because senior managers like extrinsic rewards, the whole operation works that way. Because senior managers like golf, they do teambuilding around a golf resort. Since people are often disposible, they treat them like paper tissues (I will go no further in that description). Executives are SO far isolated from the workers that they have little clue as to who they are or what they do. Why should they treat them with respect? How can a chain of 5000+ retail stores operate with none of the workers qualifying for any benefits — no health care in a company that labels itself a pharmacy? Look at the people on minimum wage – 80% work for billion dollar companies that are profitable. Some even help their new hires apply for Medicaid and other government benefits designed to help the poor — and these are the new hires. Let’s not place all the blame on HR. Lots of guilty parties making a lot of financial decisions to support the stock prices, not the people. Are there good exceptions? Surely. Addendum: It is about Money. That means it is about Taxes and reducing costs. Does that really seem like a good base for building people skills and investing in organizational development? Any wonder why “Re-Engineering” took off and the focus changed from improving the processes to reducing headcount. Seriously, I think you’re nailing an important component of this issue. It seems to boil down to the idea that HR is the “puppet” of people at the top. We know people are reluctant to give up power once they have it. And things can get really crazy as top managers try to gain even more control over how things work and who does what when. So, what is the role of HR in all this? Is it to simply help senior managers control the behavior of the employees or is it to help the employees generate a sense of self-worth and to create some engagement and involvement in what happens in their workplaces? Is HR there to help the corporation control “all things people” or simply to help keep costs under control and manage “Human Resources,” you know, the people who do ALL of the Actual Work in the organization? It is an interesting paradox, for sure. What do you think are the main barriers for an employee to come up with a new idea? But then some leaned toward putting the blame on the employees and the workplace climate of not sharing and the wasting of time focused on rumors and money or trying to get the favor or the boss. Blame was even focused on the issues of perceived respect or the lack of training. Don’t think about an elephant! The premise seems to be that people are somehow choosing not to come up with an idea in some of the posts. If YOU are working at a job and some aspect of it does not seem to work smoothly, how can you NOT come up with a better idea as to how to make things work more smoothly? The elephants are all around the workplace. But it is NOT the issue of there being no ideas, the issue is that no one seems to want to listen to them. People will “rumor” about good ideas just as much as they will rumor about workplace crapiola. I use one of our tools and show them a wooden wagon rolling on Square Wheels. The cargo are round rubber tires. And nearly everyone (including most senior managers) seem to agree that it is how things really work in most organizations. The Square Wheels represent “things” so the discussion tends to lean far from the issues of personality. The round wheels simply represent “ideas”. Not all of them are good (the wheels do not have rims or there is no air in the tire). But there are LOTS of ideas when one uses group processes to involve and engage people. The issue is that everyone is too busy doing things like they have always done them and there seems to be no time nor resources to do anything differently. Or, the issue is an interdepartmental one and we know how well interdepartmental collaboration works (an oxymoron, for sure, in many organizations. It is NOT a dearth of ideas (even for new product development), but an issue of engagement and implementation of those ideas. I call it Engagimentation and it involves generating a vision / goal, managing resources and expectations, and allowing the people to try the new ideas in a low-risk, high support kind of context. My thinking is that the supervisor can work with the people to design case studies around problems and value and help people focus on roadblock management and collaboration. We accomplish this with the use of our Square Wheels illustrations along with our team building tools. Generating a culture of collaboration and innovation and defining the best approaches to implementing ideas in the workplace is pretty straightforward, in my thinking. People want to be involved and be asked to participate. Peer support can be a powerful motivator of collaboration and engagement. Engagimentation is a pretty simple thing, really, but you have to stop pulling and pushing to allow people time to see what is happening and talk about alternatives. You can read more about it here in my blog. But if we keep doing the same things the same way, you can pretty much expect the same results. Check it out! Engagement is not rocket science — it is actually quite straightforward and can be accomplished if the culture is supportive of these kinds of initiatives. It MUST be seen as VALUABLE. People and Performance — Here are some simple poems and frameworks to get people thinking about issues and opportunities. The goal is to generate one good thought or insight into doing things differently. This cartoon image comes from our team building exercise, The Search for The Lost Dutchman’s Gold Mine and is an integral part of our debriefing package. Players must deal with all sorts of mud to generate their successes. In the game, mud on one of the selected routes to the mine causes teams to use extra resources and energy, just as it does in the real world. They know that it will cost that extra Fuel, but they are surprised by that nevertheless. Mud is the glop that people have to deal with so often in the workplace, taking the form of bureaucracy, politics, culture and the other things that do not support innovation and improvement. Mud simply bogs one down and costs extra energy to deal with it. Mud also occurs when people choose to compete rather than collaborate, since one group will often create problems for another group that shares the same overall goal. This happens clearly in the Dutchman game. It also happens all the time in organizations — we call it Interdepartmental Collaboration! Mud is a pain to deal with — some might find it to be cement while others find it to work more like grinding paste, that grit that wears things out. We can make improvements. We must make improvements. Solutions abound. Ideas are everywhere. We just need people to consider other alternatives and choose to collaborate and cooperate and look to do things differently. The lyrics of Pink Floyd’s “Us and Them” are somewhat about teamwork and leadership — I love the tune (still humming it!). And I have used this cartoon of US being built up full of THEM for 20 years. In Lost Dutchman, a tabletop of people will choose to work together on the shared goal of, “Mining as much gold as we can,” and miss the them of “Mining as much gold as WE can,” which is the purpose of the game from the standpoint of the Expedition Leader. Each team’s success is important, but the overall success is more important, right? That first lyric talkes about “US” being ordinary people. Ordinary men can do extraordinary things and it is all about the choice and choices people make. But we need to understand that Us is We and that They is Us. We’re all in this together and need to be more aligned, with better leadership. Have fun out there, and remember to involve and engage. New Square Wheels tools for improvement are on the way, focused on building teams and increasing employee engagement.